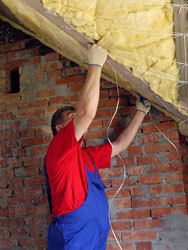 Although you rarely see it, insulation is by far one of the most crucial features of your Wisconsin or Minnesota home. Without it, it would be next to impossible to stay comfortable, and your heating and cooling bills would be astronomically high. Even homes in more temperate climates need insulation as it is often the only line of defense against the outdoor heat and cold. Fortunately, this product has come a long way over the years and homeowners have more options today than they ever did before in terms of insulating and protecting their homes. At The Board Store Home Improvements in La Crosse, Wisconsin, we proudly install both fiberglass and blown-in cellulose insulation in homes throughout the area. We are an Owens Corning Preferred Contractor that is qualified to insulate homes of any shape and size, and we have many years of residential insulating experience to our name. Contact us today to receive more detailed information about our Owens Corning insulation. We also offer sunroom additions, siding, bathroom remodeling, entry doors, and gutters to homeowners in cities like La Crosse, Winona, Caledonia, and Westby.